The Gulden Leeuw was built in 1937 on behalf of the Danish Ministry of Agriculture and Fisheries. During her period of service for the Danish government, she was frequently used for marine biological research, not only in Danish waters but also in international ones. 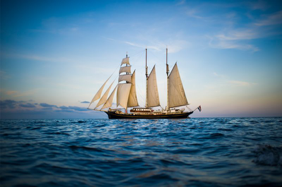 She now is registered in the Netherlands and is one of the world's largest three-mast-topsail schooners. Used for day trips, special events and Sail Training, (just like this) the Ship and its crew has extensive experience providing opportunities for youth and young adults all over the world. Recently, she and her crew were hosts to the Canadian ‘Class Afloat‘ program; 15 to 20 year old students receiving fully accredited senior high school and university programs while sailing to over 20 ports on four continents. Their professional crew consists of trained and experienced sailors which hold all required certificates. The (deck) layout of the Gulden Leeuw guarantees a safe learning environment. 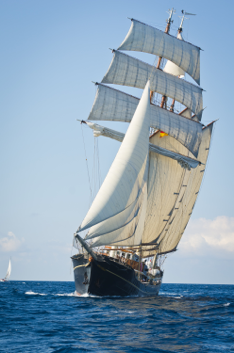 The Gulden Leeuw was built with the function of sail training in mind. They are passionate about sail training and are eager to "show you the ropes." The ship has very high safety standards with strict Dutch additional safety requirements on top of SOLAS (Safety of Life at Sea Convention) requirements. As soon as you step on board you are considered as "one of the crew." The ultimate goal is for the trainees (that would be you) to take over the ship. Therefore, everything is done by the trainees – from watch keeping to cleaning the deck. The professional crew on the Gulden Leeuw believe it should be your vessel and your challenge. Complementing their program which makes it possible to find out where your qualities and personal challenges lie, is a daily leadership and mentoring component designed specifically for this project that will incorporate culture, community and capacity building for you as a leader in your community. Throughout the course of the journey, from Halifax Canada to Le Havre France, you are provided with a sense of seafaring tradition and values, which are indispensable for life on board and living within a close community. The group on board is an independent community, almost like a small community in terms of the challenges that it faces, which cannot be ignored and must be overcome. In doing so, personal commitment is promoted and reinforced. Due to the small size of the team in comparison to those on board large freight vessels, the trainees can assist in every area on board – from the ship’s management, right through to route planning. With bunk style beds, showers and all meals provided, when you are on ship, you are on duty. Everyone matters and has a role to play. Each member of the crew is important and together helps reinforce that everyone belongs. This is not a holiday at sea: it is a life changing, skill building, confidence enhancing, relationship making, hard working adventure. One that you will never, ever forget. Click here to learn more about the Partners working together to make this project a reality! Click here on June 21, 2017 National Aboriginal Day to meet the Warriors of the Red Road at Sea!